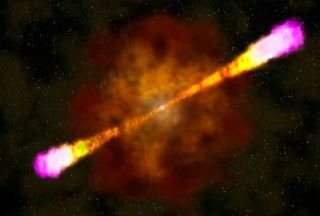 An artist's illustration of a gamma-ray burst, the most luminous type of explosion in the universe. The most powerful explosions in the universe may be even more exotic than scientists had thought. There's a weird mix of order and chaos in the light blasted out by gamma-ray bursts (GRBs), brief but intense outbursts associated with the formation of black holes, a new study reports. "The results show that, as the explosion takes place, something happens which causes the photons to be emitted with a different polarization direction," Merlin Kole, a researcher at the Department of Nuclear and Particle Physics at the University of Geneva in Switzerland, said in a statement. "What this could be, we really don't know," added Kole, one of the new study's two lead authors. The Gamma-ray Burst Polarimetry experiment POLAR launched aboard China's Tiangong-2 space lab on Sept. 15, 2016. The glowing green light mimics the scintillating light when a gamma-ray photon hits one of the instrument's 1,600 specially made scintillation bars. This illustration is based on a picture taken by a camera located several meters behind POLAR. The most powerful GRBs are unleashed when massive stars go hypernova — an especially intense type of supernova — and then collapse to form black holes. (Astronomers think a less energetic class of GRB may flare up when two superdense stellar corpses known as neutron stars merge, forming a black hole.) These black holes emit jets of incredibly fast-moving material along their axes of rotation. Scientists think GRB radiation is produced within these narrow relativistic jets, but exactly how that happens is unclear. More information about GRB light could help — and that's where the new study, which was published online today (Jan. 14) in the journal Nature Astronomy, comes in. Kole and colleagues analyzed data gathered by an instrument called POLAR, which launched to Earth orbit aboard China's Tiangong-2 space lab in September 2016 and ceased operations in April 2017. As its name suggests, the instrument was designed to gauge the polarity of GRB light. POLAR was a square measuring 19.7 inches (50 centimeters) on a side packed with 1,600 "scintillating bars." GRB photons that hit these bars sometimes produced additional photons, leading to secondary collisions. "If the photons are polarized, we observe a directional dependency between the impact positions of the photons," co-author Nicolas Produit, a researcher at the Department of Astronomy at the University of Geneva, said in the same statement. "On the contrary, if there is no polarization, the second photon resulting from the first collision will leave in a fully random direction." POLAR detected 55 GRBs during its operational life. For the new study, the researchers analyzed five of the most powerful bursts. They delved especially deeply into one 9-second-long GRB, partitioning it into roughly 2-second-long "slices." It was this work that revealed the surprising polarity shift. "We now want to build POLAR-2, which is bigger and more precise," Produit said. "With that, we can dig deeper into these chaotic processes, to finally discover the source of the gamma rays and unravel the mysteries of these highly energetic physical processes."